Winsome e cigarette e liquid is a soft tobacco flavor that is modeled after tobacco used in cigarettes to give you that cigarette taste. It is a smooth, light flavor that will satisfy your craving for the taste of a cigarette. 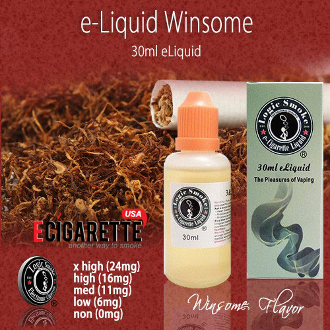 Pick up a bottle of Winsome e cigarette e liquid from Logic Smoke and satisfy your cravings. The 30ml e cigarette e liquid bottle is a convenient and economical size for purchasing in quantity. Fill your clearomizer or other e-liquid atomizing device directly from the bottle or use it to refill your smaller travel-size e-liquid bottles. You'll be ready and have liquid on-the-go at any time.